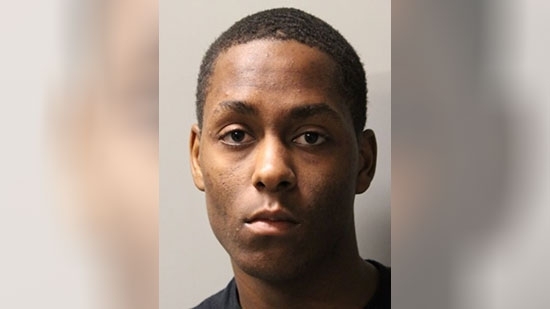 An 18-year-old Delaware high school student was arrested after pulling a gun on another student during an altercation. Tymerere Moore of Middletown is charged with possessing a weapon in a school zone, theft of a firearm and aggravated menacing. It started Friday morning, 5/18, at Middletown High School when Moore threw a bottle at a female student. A male student intervened and confronted Moore. They took their dispute to a nearby bathroom. That's when Moore pulled the gun out of his backpack and pointed it at the other student ending the argument. No shots were fired and the student was not injured. School officials found Moore and brought him to a secure office after hearing he had the gun. Police say he stole the weapon from a vehicle on his way to school. He is being held of $30,000 bond and will not be returning to the school. Philadelphia Police are searching for a second suspect related to the defacing of the Israeli flag along the Ben Franklin Parkway in Center City on Tuesday afternoon, 5/15. New video shows a man using a water gun to spray red dye or paint onto the flag as it hangs. The Philadelphia District Attorney’s Office had to rescind charges against 26-year-old Antoine Guyton who was arrested for the vandalism as the video shows a different person. They do say that they believe Guyton had a role and plan to rearrest him on different charges. The driver in a fatal hit-and-run accident that left an 11-year-old boy dead in South Philadelphia on Friday afternoon is not facing charges at this time. 11-year-old Julian Angelucci was crossing the street on his bike on the 1000 block of Shunk Street around 3 p.m. Friday, 5/18, when he was struck. The boy was rushed to Thomas Jefferson University Hospital where he died a short time later. Police say that the 48-year-old female driver of the 2012 black Mazda CX-9 that hit Julian continued driving on Shunk and then pulled over to call 911. She then drove to the Third Police District station. She was questioned by officers and allowed to leave. On Saturday, 5/19, police say that charges are now pending. A massive 5-alarm fire tore through a vacant warehouse in North Philadelphia on Friday night. It started around 6:30 p.m. on the 2100 block of Lippincott Avenue. The structure look up an entire city block and was engulfed in flames. Philadelphia Fire Commissioner Adam Thiel said, "We essentially used most of the Philadelphia Fire Department on this incident." Riders of passing SEPTA Regional Rail trains posted video and photos of the blaze to social media. No one was injured. The cause of the fire is under investigation.